This app Files To SD Card is used to quickly move, copy or backup files from internal memory to your phone's SD card. With this program, you can free up with one click your device internal memory or backup your files to the SD card. What are the colors graph of internal memory and SD card? Brown - Size of data of apps - each app has its size and its data. Our app has not access to this memory. App want to select root directory of SD card, how can I do that? Click on "Select SD Card". Dialog with Image, you look on Image and press - OK.
select (root-) directory of SD card. 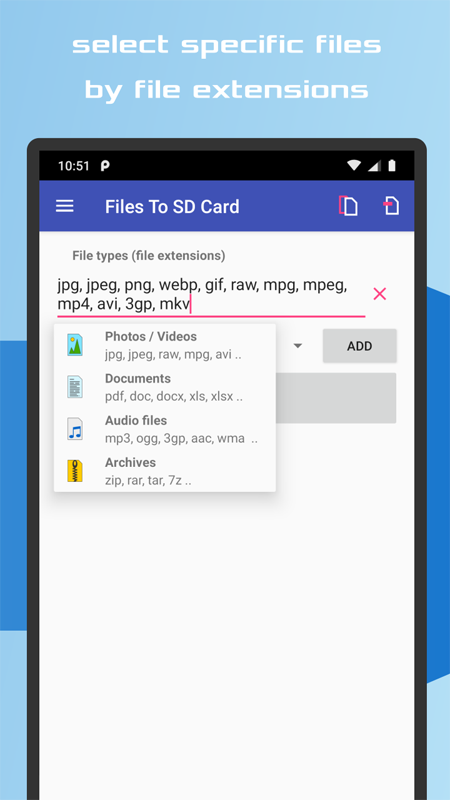 How can I move files to SD Card? Click big button (point 2a) OR press MENU on App (point 2b). After pressed MENU click yet on "Select SD Card". Dialog with Image, you look on Image and press OK.
select (root-) directory of SD card.. I want to move my apps on SD Card, how can I do that? 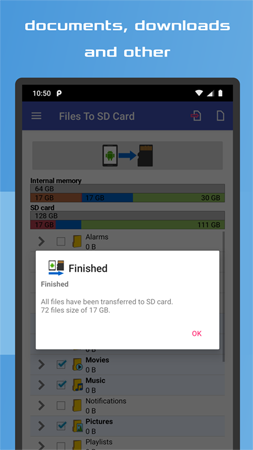 It is impossible to move apps to SD card using Files To SD Card ! App is intended for moving files. You can move or back up files like documents, photos or videos and files of some apps, for example photos from Facebook or Whatsapp. If you move the data files that an application uses, it can happen, that app will not work properly. OS Android -> Options -> Apps and Settings -> Select App -> Move to SD. This may not work for all apps and not for all devices (manufacturers), but it's the only option for transfering apps to SD. How to copy and backup files? For switching between move and copy (back up) you have to click on first "file icon" in the upper row of the running application. How to select only specific files for transfer like photos and videos? It is default set selecting from all files you have on internal storage. Click on second "file icon" in the upper row of the running application. Click to select box of type of file extensions. Select extensions of files you want to specify. Now please click on green check ok button. Now are marked only selected files by extensions you choose. Where can I find my files on SD Card after moving/copying (back up)? 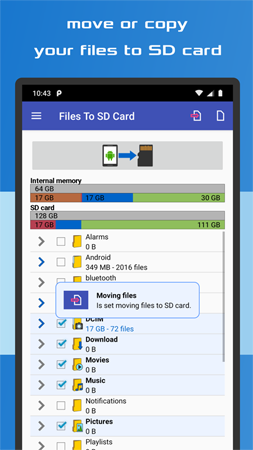 Files you move to SD card with Files To SD Card should be on SD Card in the same structure as on the internal memory. App moves only files you choose. How do I return the files back to Internal memory? There is no way of using of my program to move files back. You must find files via other FilesManager application and try move back or connect device with PC via MTP protocol and find and copy files from SD to intternal memory. I have problem to transfer files of larger size than 4 GB. Why? 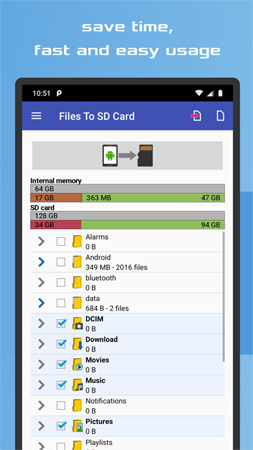 Some devices, especially with System Android One, do not support exFAT SD card format, but only Fat32. Therefore only files with a maximum size of 4 GB can be transferred. You will not move or copy files larger than 4GB to an SD card formatted with Fat32. The Fat32 format does not allow larger files of 4 GB. 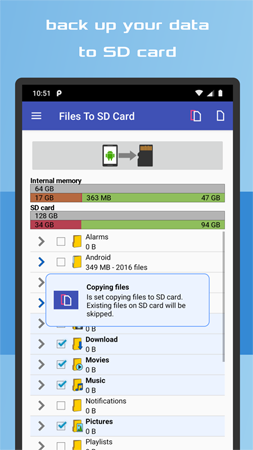 In this case, Try before using SD card to format the SD card on computer with exFat format. I still have full memory and little space in internal memory. If you still have full memory, it's probably caused by the number of installed apps. The internal repository is divided into several parts of which two are main. One is for the Android operating system and the installed apps (each app has its own storage), another part is the internal memory stuff for the files. From internal memory, our application is moving files to SD. 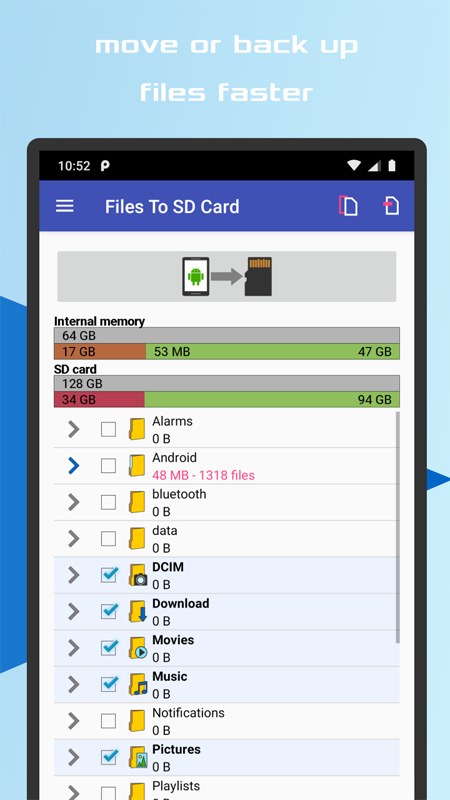 If it wants to free up more space and increase internal memory, you will need to focus on moving the apps to the SD card but this may not always work. This must be enabled by the application developer and device manufacturer. Furthermore, the app must not contain services. No app can move Apps, only invokes Android system settings, that is the only way it goes. There is still a possibility to clean the application store. Another option is to uninstall unneeded apps.